Conversation is first and foremost about action; people don’t just talk, they do things like greeting, offering, and inviting. 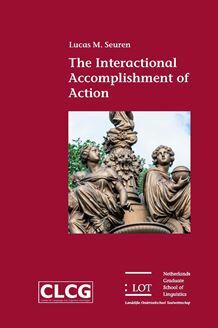 Understanding how speakers use the grammar of their language to implement action is a problem that has attracted attention from scholars in linguistics, sociology, anthropology, and philosophy for decades, but a satisfactory explanation still eludes us. This dissertation sheds light on this problem by carefully analyzing how participants grammatically design a select number of specific social actions. The main finding is that in the study of social interaction analyzing what people do, and when and where they do it, should take priority over analyzing how they do it. Any turn in conversation is principally understood and designed to be understood by its position in the conversation, particularly the immediate prior turn. This means that the design of a turn is constrained by the local exigencies of the interaction, and thus that there is no direct path from form to function. That is not to say that language is not used to implement action and thereby project a certain type of response, but linguistic design is subordinate to the sequential environment. The foundational work in conversation analysis showed that linguistic structure makes smooth turn-taking possible: by enacting conventionalized structures speakers can project when their turn will come to completion. This dissertation suggests that action might work in a similar way. By taking into account the sequential environment participants can project what will come next; grammar supports this projection thereby facilitating action ascription.